Fleet Admiral, born 1885, died 1966. Nimitz graduated in the Class of 1905, finishing 7th in a class of 114. Upon graduation he was assigned to the U.S.S. Ohio, serving in her for the two years of sea duty then required before commissioning as an ensign in January 1907. He received his first command, the river gunboat U.S.S. Panay, which later became famous for reasons having nothing to do with Nimitz, who served in her only briefly. Later in 1907, Nimitz began a long association with submarines. He commanded U.S.S. Snapper, U.S.S. Narwal, and U.S.S. Skipjack until 1912, then served as commander of the Atlantic Submarine Flotilla until 1913. After studying diesel engines at factories in Germany and Belgium, Nimitz served as both Executive Officer and Engineering Officer in the diesel tanker U.S.S. Maumee. He served in that billet until 1917, when he was assigned as Aide and Chief of Staff to COMSUBLANT, a position he held during World War I. He was promoted to commander during that period. In September 1918, Nimitz was assigned to the office of the Chief of Naval Operations. He also became a member of the Board of Submarine Design. In 1919 he became Executive Officer of the U.S.S. South Carolina. Following this, he returned to submarines as COMSUBDIV 14 at Pearl Harbor. Nimitz would also command Submarine Division 22, the U.S.S. Augusta (flagship of the Asiatic Fleet), and spend three years as Assistant Chief of the Bureau of Navigation. Promoted to rear admiral in 1938, he became commander of Cruiser Division Two, and then Battle Division One, leaving this position in 1939 to become Chief of the Bureau of Navigation. Following the Japanese attack on Pearl Harbor, Nimitz was made Commander in Chief, Pacific Fleet (CINCPAC), a position he held until after the Japanese surrender. He was promoted directly to Admiral—skipping over vice-admiral—on the last day of 1941, and became a Fleet Admiral on 19 December 1944. 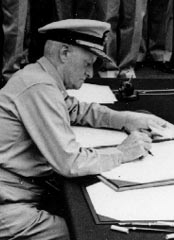 At the Japanese surrender, Nimitz signed for the United States. Following the war, Nimitz served as Chief of Naval Operations, and in a number of civic positions. He passed away on 20 February 1966.